Right then, here comes the Summer. The ultimate test. Maybe. 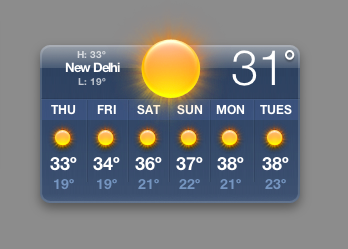 When I arrived in Delhi in January 2013 it was surprisingly cold. Even for seasoned Dilliwalas it was something to talk about… supposedly the coldest winter for 40 years. For nine straight days since December 31, the capital hasn’t seen temperatures rise above 16 degrees Celsius and the minimum has remained below 6 degrees. Taking these two temperature limits as cutoff, TOI sifted through data for the past 40 years. No other unbroken spell of biting chill—both minimum and maximum temperatures staying this low—had sustained for as long as this, it was found. Folks in more Northern climes will laugh at winter temperatures “not rising above 16 degrees”, but it did feel very chilly at times, especially in the damp foggy mornings. And when there are no carpets and no proper heating anywhere. Since the end of February/beginning of March, the temperature has gradually been moving up a notch every day or two, and for the past few weeks it’s been in the very pleasant low 30s. A few weeks ago, I started having to put the ceiling fans on in the evening, and then in the bedroom overnight. With a light breeze and blue skies, this is the kind of weather I would consider perfect on holiday. (As it is, I’ve seen very little of it due to spending most of my days in the office.) Over the past week or two I’ve noticed that butterflies are appearing everywhere during the day, and crickets are chirping in the evenings. But now we’re at the beginning of summer, and that ominous-looking weather forecast above reckons we’ll hit 37 this weekend. Found the first cockroach in the flat today too. Given that it was 45 degrees for a week or two during a heatwave last June, I’m a little bit apprehensive about how I will cope. For the last few days I’ve been arriving at the metro station and starting to drip with sweat as soon as I board the train. Then again, my flat is quite cool and I’ve just had the air conditioning serviced, even though I’ve not had to actually use it yet. So… I’m ready. I think.